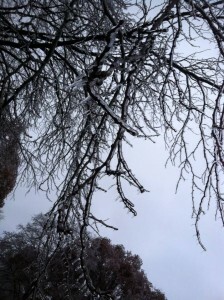 The icy weather over the past few days caused a lot of tree damage. Be safe out there! 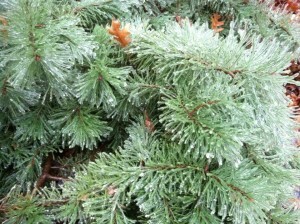 Winter storms may cause serious tree damage. Often you will have to decide whether a tree can be saved or not. Here is a checklist on care of a storm‑damaged landscape. 1. Be safe: Check for downed power lines or hanging branches. Don’t venture under the tree until it is safe. If large limbs are hanging precariously, a certified arborist has the tools, training and knowledge to do the work safely. Also, downed limbs and trees may be under compression. Cutting through a limb under compression can release that energy causing the limb to whip and possibly injure anyone near. Again, consider an arborist if safety is a concern. 2. Cleanup: Remove debris so you don’t trip over it. If there is still ice, it is best to wait until all has melted before beginning work. 3. Decide whether it is feasible to save a tree. If the bark has been split so the cambium is exposed or the main trunk split, the tree probably will not survive and should be removed. If there are so many broken limbs that the tree’s form is destroyed, replacement is the best option. Topping, where all the main branches are cut and there are only stubs left, is not a recommended pruning procedure. Though new branches will normally arise from the stubs, they are not as firmly attached as the original branches and more likely to break in subsequent storms. Also, the tree must use a lot of energy to develop new branches, leaving less to fight off diseases and insect attacks. Often, the topped tree’s life is shortened. 4. Prune broken branches to the next larger branch or to the trunk. If cutting back to the trunk, do not cut flush with the trunk but rather at the collar area between the branch and the trunk. Cutting flush with the trunk leaves a much larger wound than cutting at the collar and takes longer to heal. Middle‑aged or younger vigorous trees can have up to one‑third of the crown removed and still make a surprisingly swift comeback. 5. Take large limbs off in stages. If you try to take off a large limb in one cut, it will often break before the cut is finished and strip bark from the tree. Instead, first make a cut about 15 inches from the trunk. Start from the bottom and cut one‑third of the way up through the limb. Make the second cut from the top down but start 2 inches further away from the trunk than the first. The branch will break away as you make the second cut. The third cut, made at the collar area, removes the stub that is left. Here Comes The Asian Lady Beetle! This is the time of year when the Asian lady beetle, Harmonia axyridis adults start entering homes and becoming a nuisance. The Asian lady beetle is a native of Asia and was introduced into the southeastern and southwestern portions of USA to deal with aphids on pecan trees. However, it spread rapidly to other portions of the USA. It is a tree-dwelling lady beetle, more so than the native species of lady beetles, and a very efficient predator of aphids and scales. 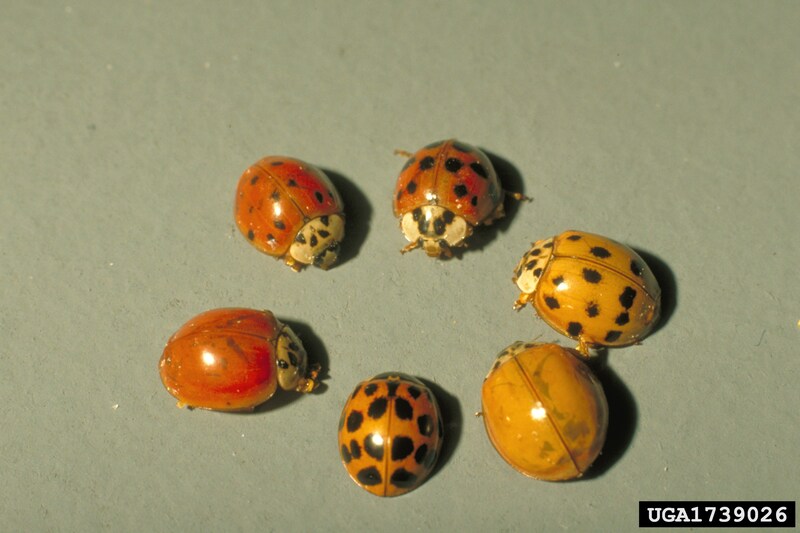 During fall and early winter, when the weather is cooler, Asian lady beetle adults start congregating on the south side of buildings and entering homes. The beetle does this because in their homeland of China they inhabit tall cliffs to overwinter. There are very few “tall cliffs” in Kansas—so the next best thing is a building. The Asian lady beetle can be easily distinguished from other species of lady beetles by the presence of a pair of white, oval markings directly behind the head, which forms a black M-shaped pattern. Adults are 1/4 inch long, 3/16 inch wide and yellow to dark-orange colored. In addition, their body is usually covered with 19 black spots. Adults can live up to 3 years. Female beetles lay yellow, oval-shaped eggs in clusters on the underside of leaves. The eggs hatch into larvae that are red-orange and black in color, and shaped like a miniature alligator. The larvae are primarily found on plants feeding on soft-bodied insects such as aphids and scales. They eventually enter a pupal stage. Pupae can be seen attached to plant leaves. The adults emerge from the pupae and start feeding on aphids. Adults can be found on a wide-variety of trees including apple, maple, oak, pine, and poplar. Asian lady beetle adults are a nuisance pest because they tend to congregate and overwinter inside buildings in large numbers. The beetles release a pheromone that attracts more beetles to the same area. Although the beetles may bite, they do not physically harm humans nor can they breed or reproduce indoors. Beetles are attracted to lights and light-colored buildings, especially the south side where it is warm. They then work their way into buildings through cracks and crevices. Dark-colored buildings generally have fewer problems with beetles (so now is the time to paint your house). Adult beetles will feed on ripening fruit such as peaches, apples, and grapes creating shallow holes in the fruit. Large numbers of beetles feeding on fruit may cause substantial damage so that the fruit is less appealing for consumption. If crushed, the beetles will emit a foul odor and leave a stain. The dust produced from an accumulation of dead Asian lady beetle adults behind wall voids may incite allergies or asthma in people. Although there are some sprays available, the use of insecticides is not recommended for indoors.